Auntie M has been showcasing UK authors you to investigate, and now she turns her focus to home. Georgia author Maggie Toussaint is a trained scientist who loves a good puzzle, which is why she tackles mysteries in addition to writing romantic and contemporary suspense novels. 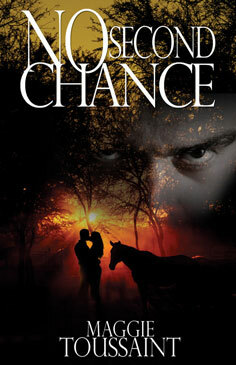 Of interest to note is one of Toussaint’s romantic suspense novel, No Second Chance, whose proceeds benefit Day’s End Farm Horse Rescue in Lisbon, MD, which rescues horses from all over the country. One to look for on Amazon.com or in Barnes & Noble is Toussaint’s second Cleopatra Jones novel, On the Nickel. In For A Penny introduced single mother Cleopatra Jones an avid-but-awful golfer and competent accountant, who lives in rural Maryland and has an engaging family life. 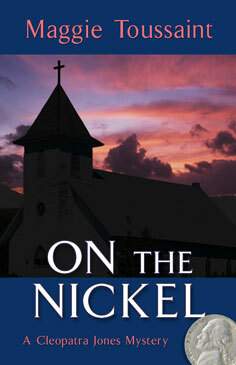 On the Nickel is the second in this series, and finds Cleo is watching over her hugely pregnant St. Bernard, two teenaged daughters, and her strong-willed mother, all while trying to contend with a new love in her life and an ex-husband who wants her back. As if that wasn’t enough drama for any woman to handle, her mother becomes the prime suspect in a murder investigation, when Mama’s church-lady rival, Erica Hodges, is run over with a car–several times. Then Cleo finds a huge dent in Mama’s Olds, and Mama refuses to discuss her movements on the night in question. 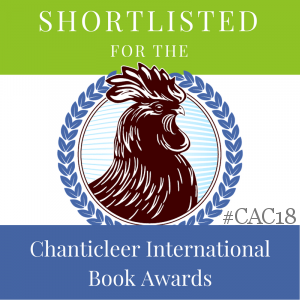 Toussaint gets all the points right: love-able but demanding teenagers; the push from an ex wanting a second chance; the pull of an exciting new love; even the behind-the-scenes hierarchy and drama of Southern churchwomen groups. This is perfect for summer reading, with its lighthearted, balanced storyline combining more than a hint of romance, as Cleo scrambles find the real murderer of Erica Hodges, and all before her St. Bernard delivers those puppies! Maggie Toussaint is a member of numerous organizations including Sisters in Crime. To learn more about her and her other novels, visit: http://www.maggietousssaint.com. Author Alison Bruce was new to Auntie M until recently. The author of two non-fiction crime books, Alison lives in Cambridgeshire with her family and turned her hand to fiction, introducing Detective Constable Gary Goodhew, the youngest, and probably brightest, detective in Cambridge’s Parkside Station. 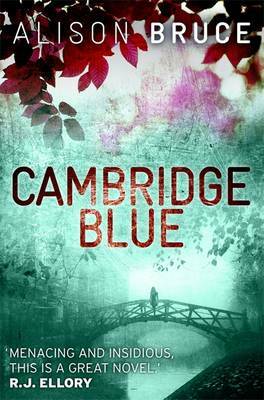 Cambridge is a wonderful setting and Bruce does it justice, using the river and its environs to jumpstart a fast-paced mystery that never lets up in her first entry, Cambridge Blue. After an intriguing prologue, DC Goodhew is first on the scene at Midsummer Common after the body of Lorna Spence is found. Although it’s his first murder case, Goodhew quickly becomes involved, to the chagrin of his new partner, DC Michael Kincaide. 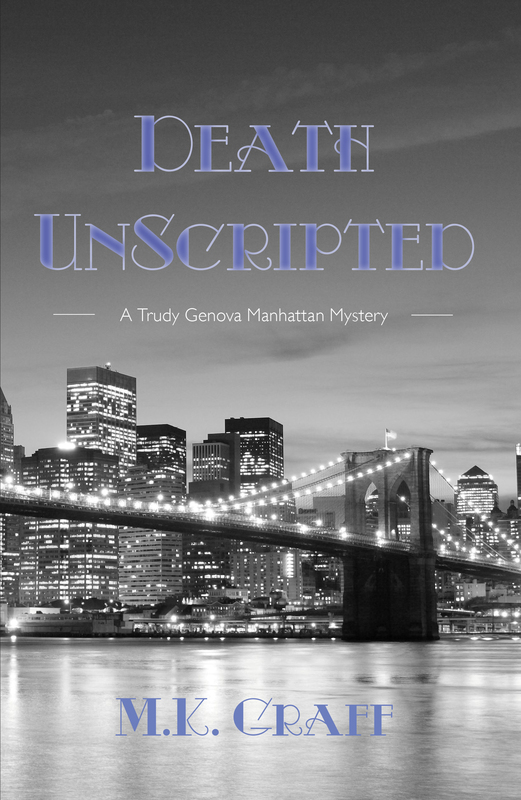 Lorna was well-liked and there appears to be no motive for her murder–until a second brutal murder is committed in similar circumstances, kicking the investigation and the pacing into overdrive. Bruce does a nice job of introducing the other characters in her plot; one who will return besides Goodhew’s partner and his DI, is his grandmother, a spry woman with a wise mind. 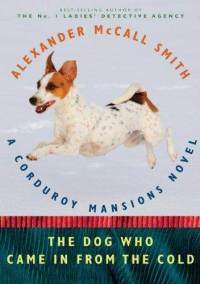 As the investigation moves along, Goodhew’s instincts ripen, and despite what we think we know, Bruce manages to surprise her readers with twists and more twists in this agreeable novel. 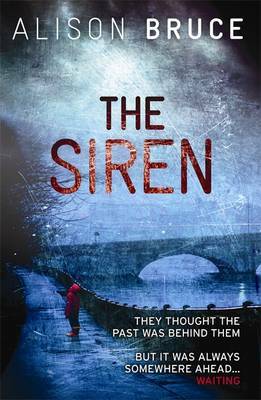 In her second outing, The Siren, Goodhew forms an unlikely alliance with a young witness. Two young women, Kimberly Guyver and Rachel Golinski have a shared past they thought they’d left behind, until it catches up with them in a startling way, leaving Rachel’s house burned down, and Kimberly’s young son, Riley, missing. As Goodhew investigates both incidents, he uncovers conflicting stories: Kimberly is distraught but also defensive and at times seems uncooperative to him. Is this the natural result of a life lived in foster homes, suspicious of police and anyone with power, or is it born out of fear that he will find his way to the bottom of the lies she’s told him? With the life of a young child hanging in the balance, Goodhew races to save lives and almost loses his own in the process. Bruce does another great job of parsing out Goodhew’s back story whilst showing him maturing and evolving in his job and in his life. One device she shares with her readers is the playlist she listens to whilst writing these novels. These songs keep her company when she’s writing and for her, they “belong” to each novel. I was delighted to read this, as I work in a similar way, with certain pieces of music attaching themselves to a project as I’m writing, which become identified for me with that work and sometimes influence it. First, Julia S-F has hit the ground running with the latest entry in her series featuring Episcopal priest, Rev. Clare Ferguson and her sheriff lover, Chief Russ Van Alstyne. Their romance has been handled delicately through past books, and hits its stride here in One Was a Soldier. (The title happens to be a line from one of Auntie M’s favorite hymns.) Rev. Clare is an accomplished helicopter pilot, and has just returned from combat duty in Iraq. She finds herself one of five veterans attending a counseling group, each one carrying the baggage and problems active duty brings. The vets struggle with drug dependency, explosive rage, brain injuries and the guilt of an in-country affair. One young track star grapples with adjusting to facing life as a double amputee. The ravaging effects of war are handled here with understanding and compassion. And then murder rears its head, and a conspiracy is feared which may affect them all. This takes place as Russ and Claire try to iron out their complicated relationship. Satisfying and complex. 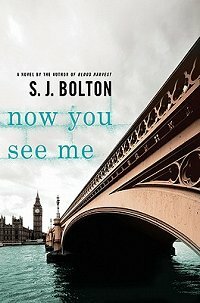 Next up is Now You See Me from S. J. Bolton, whose stand-alone thrillers just keep getting stronger. 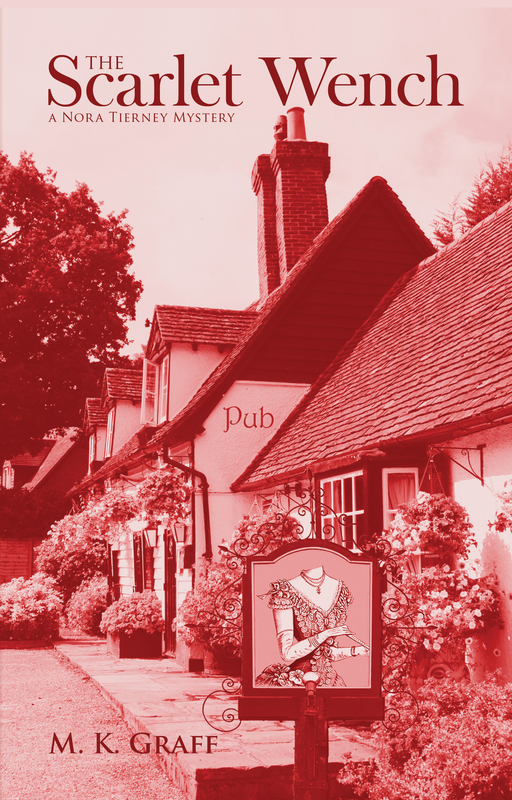 Bolton’s fascination with British folklore has made all of her novels a treat for readers. 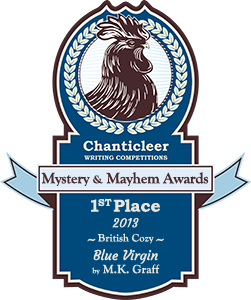 This time Bolton and her protagonist, newly-minted detective Lacey Flint, take on a Jack the Ripper-like killer, hellbent on recreating some of London’s bloodiest past. The opening hooks you: seconds after interviewing a reluctant witness in a different case, Lacey finds a viciously stabbed woman hanging onto her car door. The woman has been brutally stabbed and literally dies in Lacey’s arms. This strong beginning doesn’t let up, and you will be turning pages quickly as the murders mount, all with ties of some sort to the original Ripper killings. Once Lacey’s name is mentioned in the killer’s letter to a reporter, she becomes irrevocably linked to the investigation. 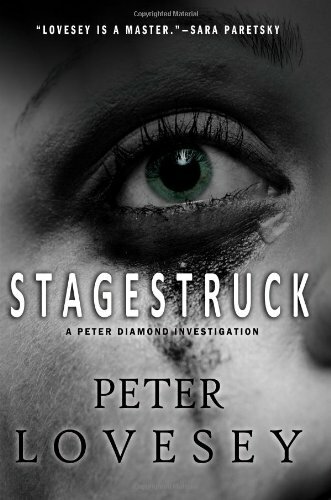 As the killer taunts Lacey with his cruel game, she comes under the close scrutiny of two members of her team: DI Dana Tulloch, reassigned from her Scotland post and carrying her own demons, and Special Ops officer DI Mark Joesbury, who finds himself assigned to guard Lacey when it becomes apparent this killer has made it personal. As the investigation heats up and the bodies start to pile up, Lacey finds too many reminders of a part of her own life she’s kept hidden from everyone who knows her, including the police force. The pacing is relentless, and even when Lacey offers herself as bait for the killer and you think you know the ending, it twists away from you on a different course. Fast-paced and riveting. The newcomer to this grouping is A. D. Scott, living now in Australia, but raised in the Scottish Highlands. 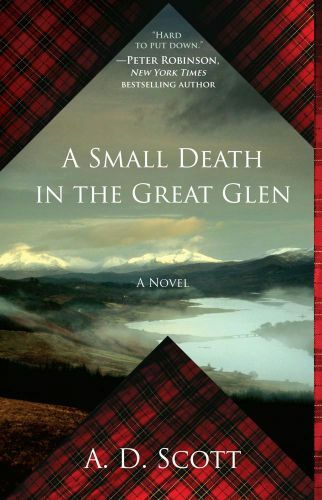 Scott uses all five senses to make the area so real it jumps off the page in her debut A Small Death in the Great Glen. Scott deftly brings her readers into 1950’s Scotland, where WWII is still on most residents minds. That includes the varied staff of a small town newspaper who we visit in turn, and whose actions push the story forward. After his disappearance, a young boy’s body is found drowned in the canal, and when murder is decided, panic threatens to overtake the villagers. Threads of religious intolerance, petty jealousies, and prejudices rise up against the conventions of the time as suspicion moves around. Two young girls, daughters of the paper’s typist, tell a story about seeing the boy and his actions just before his disappearance. Joanne Ross is trying to protect her daughters even as she suffers in silence in an abusive marriage. What other choice has she in the 50’s, when her own relatives tell her this is the lot she has drawn and it is up to her to keep the marriage going for her children? The pathos of her failed relationship, her guilt, and her efforts to hide it, are seen readily by the staff she works with daily. As the investigation into the boy’s death travels on, different characters in the area are subjected to the microscope of such a case. These include a Polish sailor who is trying for refugee status, a corrupt town clerk, and the Italian family whose daughter is Joanne’s friend, and whose cafe’ offers the first known cappuccino machine in northern Scotland. Everyone has secrets, and none are left unturned in this fine debut novel. Auntie M looks forward to the sequel, where many of the intriguing characters Scott has drawn will reappear.